Be the first to share your favorite memory, photo or story of Dr. Alfred. This memorial page is dedicated for family, friends and future generations to celebrate the life of their loved one. 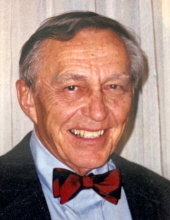 Dr. Alfred John Herlitzka MD died in his home of natural causes on February 9, 2019. Dr. Herlitzka was 95 years old. Al was born is LaCrosse, WI on January 17, 1924 to Edward and Nettie (Starch) Herlitzka. Dr. Herlitzka attended Central High School in LaCrosse. At the age of 18, in 1942, Al enlisted in the Army Air Corps and served in the Pacific Theater in WWII. There he completed 40 missions on the B-24 Liberator. During his service, Al earned the Distinguished Flying Cross w/1 Oak Cluster, the Air Medal w/4 Oak Clusters, and a Purple Heart. Dr. Herlitzka was discharged in 1946 with the rank of Captain and began what would become a long and distinguished career in medicine. He graduated from Medical College, University of Wisconsin, Madison in 1951, and went on to complete six more years of surgical training. Dr. Herlitzka completed his General and Thoracic Surgical Boards and joined Surgical Associates of North Iowa in 1958. During his career, Dr. Herlitzka was President of the Iowa Heart Association (1967-1968) President of the Iowa Academy of Surgeons (1985-1986), and took his turn as Chief of Staff at Mercy Hospital (1978) in Mason City, IA. Al was also an Associate Clinical Professor in the Surgical Department of the University of Iowa. Dr. Herlitzka retired from the Surgical Associates in 1994 but continued to volunteer his services periodically at the St. Jude Hospital in St. Lucia in the West Indies. Dr. Herlitzka lived a full life outside of medicine as well. He was an Elder in the First Presbyterian Church and a founding member of the MacNider Art Museum Foundation Board. Al volunteered at the Mason City Community Kitchen. Al also enjoyed golf, hunting, fishing, skiing and woodworking. In a life filled with many wise decisions, the wisest Al ever made was to court and marry Yvonne Feggestad of Stoughton, WI. They married the day after he graduated Medical school in 1951. Yvonne has been his loving companion and supportive partner of 68 years. Together Al and Yvonne had five children, Nancy (Tom) Kelly, Alan (Ina) Herlitzka, Lynn (Scott) Garner, and David (Ann) Herlitzka, and David’s twin brother, James Edward, who died in infancy in 1962. Their grandchildren: Grant and Austin Kelly, Arthur and Isaac Herlitzka, Graham, Meredith and Blair Garner, and Meghan and Edward Herlitzka. Dr. Alfred John Herlitzka lived his life the way he practiced medicine. He was respectful, kind, caring and humble. Al cared deeply for his patients. His partners and the hospital and clinic staff were his friends as well as colleagues. It was his delight and privilege to practice medicine in Mason City. Dr. Herlitzka will always be respected by the patients he dedicated himself to and served throughout his life. Al made a lot of people smile and he didn’t even know it. He will always be loved by his family and his friends. Visitation will be held at Major Erickson Funeral Home, 111 N. Pennsylvania Ave, Mason City, IA on Friday February 15th from 4 - 6 pm. Funeral Services will be held at 2 pm on Saturday, February 16th at the 1st Presbyterian Church, 100 S. Pierce Ave, Mason City, IA. In lieu of flowers, donations may be made to the Hospice of North Iowa, the MacNider Art Museum in Mason City, or the 1st Presbyterian Church of Mason City. To send flowers or a remembrance gift to the family of Dr. Alfred John Herlitzka, please visit our Tribute Store. "Email Address" would like to share the life celebration of Dr. Alfred John Herlitzka. Click on the "link" to go to share a favorite memory or leave a condolence message for the family.